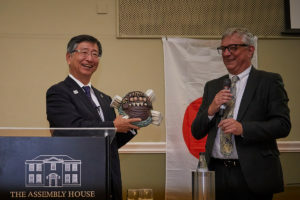 On Thursday 20th September almost 250 people joined us to mark the 200th Third Thursday Lecture given by His Excellency Koji Tsuruoka, Ambassador Extraordinary and Plenipotentiary at the Assembly House. Contributing greatly to longevity of the Third Thursday Lectures, which have been running since 2001, are our funders Yakult UK, the Great Britain Sasakawa Foundation and the Gatsby Charitable Foundation. We were delighted to have Mr Hiroaki Yoshimura, Managing Director of Yakult UK, and Mr Brendan Griggs, CEO of Great Britain Sasakawa Foundation join us for the lecture. A number of other representatives from organisations who have supported the Sainsbury Institute attended, including the Japan Foundation, the Japan Society of the UK and the Japan Society for the Promotion of Science. Professor Sarah Barrow, Pro-Vice Chancellor of Arts and Humanities at the University of East Anglia and member of the Sainsbury Institute’s Management Board, introduced the Ambassador. She explained the history of the Third Thursday Lectures, the Sainsbury Institute’s role in the city and relationship with the University. Ambassador Tsuruoka’s nuanced lecture centred on setting out the current issues affecting global international relations, and the similarities between the current situations of Japan and UK. In a question from the audience on how Brexit will potentially affect the UK-Japan relationship, the Ambassador stated that it is impossible to tell until all the numerous details of the exit deal become known but emphasised the significance to Japan of a good relationship with the UK. Professor Philip Gilmartin, Pro-Vice Chancellor of Science and International at the University of East Anglia gave thanks to His Excellency following the talk and spoke of UEA’s links with Japan and the growth of Japan as an area of research and study at the University in recent years. Professor Simon Kaner, Executive Director of the Sainsbury Institute, presented the Ambassador with a replica of one of many ceiling bosses which adorn Norwich Cathedral, a building which stands only metres away from the Sainsbury Institute headquarters. At the reception in the Forum, guests enjoyed Japanese nibbles from local restaurant Shiki and premium sake was generously provided by Sake Samurai UK. University of East Anglia Chancellor Karen Jones gave a speech on the launch of the Sainsbury Institute’s new strand of research, Digital Japan. To celebrate this launch a Mini-Festival was being held in the Forum and lecture attendees had a chance to preview an exhibition of works by academics who use digital means in their research or to present their research about Japan. Thanks to Norwich BID and in particular Norwich City Council – Councillor Alan Waters, CEO Laura McGillivray and Culture Officer Nikki Rotsos – Norwich City Hall was lit up in the colours of the Japanese flag for the first time ever, and Japanese art was projected onto the walls of Norwich Castle. This included images of maps which are held at the Sainsbury Institute as part of the Lisa Sainsbury Library, donated by former British Ambassador to Japan Sir Hugh Cortazzi. The Lord Mayor of Norwich, Martin Schmierer, hosted the Ambassador for dinner at Norwich City Hall in the presence of Norwich’s civic regalia – two swords and a mace, each several centuries old. During the dinner, the Ambassador spoke to say that he felt as though that the whole of Norwich had come to welcome him and that he looked forward to returning soon.